Whew, it’s been a good one. Unlike previous drafts in recent memory, the Philadelphia Eagles have done an amazing job this year. Through the first three-rounds, the Eagles made necessary moves to acquire talent, filling major needs and adding excellent depth at the same time. It should be noted early on — if Philadelphia was weak up the middle last season, that will no longer be an issue, as the Eagles spent three of four picks adding talent at linebacker and also on the defensive line. Why not do a quick recap of those picks? Philly landed the defensive tackle of the hour, and a player that was shooting up draft boards since the end of the combine. 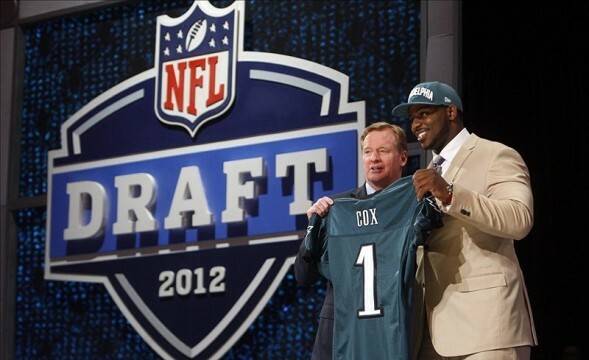 Going into the first-round, it seemed unlikely that Cox would fall to Philadelphia, but as he slid down the board, the Eagles made a move, trading up three spots, to land the Mississippi State stud. Cox is an absolute monster and will make an immediate impact on the defensive line. Despite being 300+, Cox has the versatility to bounce-out to the outside and play end if needed, but also has the strength to play defensive tackle. Expect big things. Case and point. Get ready for Cox, Cullen Jenkins, Trent Cole, and Jason Babin — also known as the best defensive line in the NFL. This may end up being the best pick of the draft for the Eagles. Kendricks is a machine and fills arguably Philadelphia’s biggest need at linebacker. Here’s a basic one sentence summary of Kendrick’s ability as a linebacker — he’s fast, agressive, has excellent pass coverage skills, plays downhill, has nearly prefect passing mechanics, and never gives up on a play. He’s essentially everything Philadelphia needed in a linebacker. His only knock is that he’s undersized at 5-11. But even with his size, he has been called the best attacking 4-3 linebacker in the draft behind Luke Kulechly. Expect big things from this kid, and he should make an immediate impact on Philadelphia’s defense. Watch out — Curry could be the next star in the NFL. Fans are already ecstatic about the Eagles selection of Curry, basically because he is a sure-fire prospect. At Marshall, Curry blasted off the defensive line like a bullet, and was near the top of the country in tackles for a loss and also sacks. He has the ability to literally run straight past offensive lineman — he’s that fast off the line. Despite not needing a defensive end, the Eagles decided to take the best player available. However, having Curry coming off the bench behind Cole and Babin is going to be nasty. It will be a relentless pass-rush in Philadelphia in 2012, and Curry is going to be a big part of that. Are we really surprised? Andy Reid loves nothing more than drafting incredibly talented college quarterbacks and grooming them into eventual starters. Take one look at Kevin Kolb (now traded), Mike Kafka (being groomed), and the newest addition to the trio is Foles. At Arizona, Foles had an excellent personal career, displaying excellent arm strength and solid fundamentals. But he does lack the talent to be a top-tier prospect, and he is still rough around the edges. He really is nothing more than a project quarterback for Reid, and expectations should be nothing more than him holding a clipboard on the sideline. However, this does add an interesting twist in what will happen to Trent Edwards, who was signed this off-season as a back-up to Kafka. All in all? A very solid draft thus far for the Eagles. Agreed! Very exciting draft and the Eagles did a great job! Look forward to seeing the mass amount of defensive talent Philly has amassed! The offense won’t be too shabby, either. Cox, Jenkins, Cole, Babin = best defensive line in football. Boykin will be a perfect nickel corner. McNutt is a total haus. Don’t know much about Washington, but I hope you’re right!